Mr. Stone's book contains the kind of cookbook interpretations which are helpful to a beginner, while Ms. Doane's book approaches a chart's astrodynes analytically and thus is especially helpful to a counselor. Astrodynes is a technique of measuring the Power, Harmony, and Discord of the Planets, Signs, and Houses. It was invented to help the astrologer to evaluate the level of energy that will be expressed by the personality of the person at birth. This will be altered by conditioning and environment and progressed planets, as the person grows older. The system is fully explained in the Astrodyne Manual and Stellar Healing books by Elbert Benjamine (C.C. Zain). You can contact the Church of Light at www.light.org. For more recent research on Astrodynes visit the Light of Egypt web site at www.lightofegypt.com, and go to the Research section. There is a new module (as of 2007) on the Astrodynes program, which is a batch processor. This gives the Astrodynes software user a Research capacity. This has the ability to analyze a large numbers of charts and the frequency distribution of the planets, signs and houses. It is done in order of the power or harmony/discord by largest to smallest power reading. It can then be put into a program like Microsoft Excel for analysis by using the copy to clipboard button. .
Astrodynes for Windows is a $59 companion program to Halloran Software's AstrolDeluxe Reportwriter. John Molfese is the author of Astrodynes for Windows. The program lets you select one or more of your AstrolDeluxe saved charts, and calculates the Astrodynes for each planet, sign, and house in the selected charts. The Astrodynes for Windows program is an accurate computerized replication of the Astrodynes created by Elbert Benjamine and W.M.A. Drake in the late 1940's. To calculate Astrodynes by hand for one-chart takes about 10 hours by hand. The computer performs these valuable calculations of power, harmony and discord immediately. Astrodynes for Windows displays the Astrodynes in the form of tables or colorful bar charts, pie charts, etc., both of which may be copied to the clipboard or printed. The main requirement for the 32-bit Astrodynes with Batch Processing, AKA Astrodynes for Windows, is that you have AstrolDeluxe (currently at version 7) or a registered copy of Astrology for Windows. 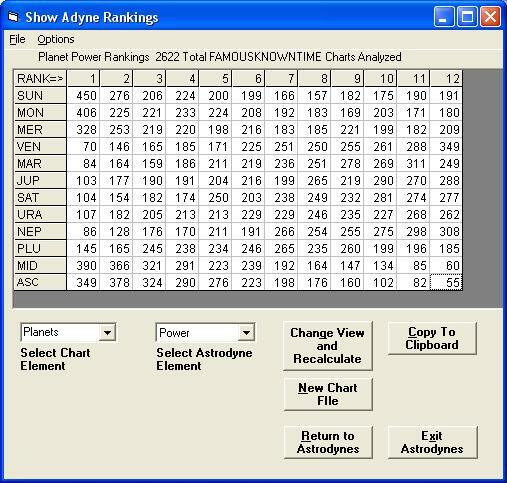 Astrodynes for Windows reads the file of saved charts from these programs. The 32-bit Astrodynes for Windows comes on a CD and runs on computers with Windows 98, ME, NT, 2000, XP, Vista, and both 32-bit and 64-bit Windows 7 and Windows 8. The Astrodynes for Windows results tell you which is the most powerful planet in the native's chart, the planet that has more contacts to all other chart points, the planet which primarily characterizes the native's approach to life. The Astrodynes for Windows program also tells you which is the native's best house -- information that a person can use to determine what would be his or her best career activities. In her book, Doris Chase Doane gives the example of a lawyer using knowledge of his best house to determine in what field of law to practice. "If his best house is the 10th, we could suggest government or political areas. If the 9th, trial lawyer; the 8th, taxes, estates, insurance; the 7th, divorce; the 6th, medical cases and labor unions; the 5th, show business or child custody suits; the 4th, real estate, hotels, restaurants, basic utilities; the 3rd, communications; or the 12th, research, and so on." Astrodynes for Windows can even help you to interpret composite charts of couples that you have saved with AstrolDeluxe for Windows. Applied to composite charts, astrodynes can reveal the theme of a couple's relationship and show how they relate as one to the world. 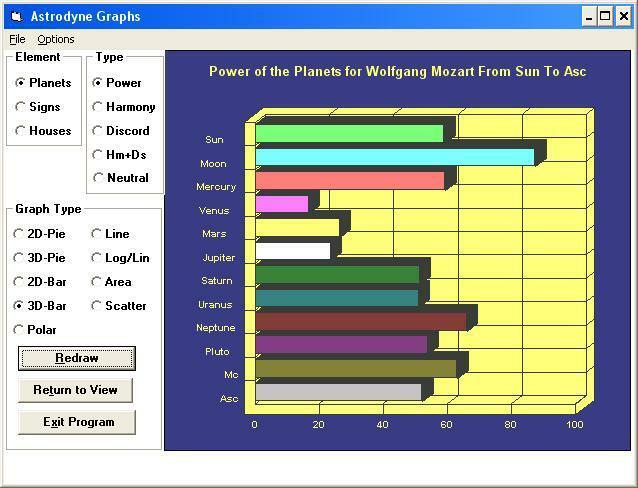 Unlike the Astrodynes for DOS program, which only printed numerical tables to the printer, Astrodynes for Windows also displays to the screen and can summarize the results graphically in colorful bar graphs, pie graphs, polar graphs, line graphs, area graphs, and scatter graphs. You can print both the graphs and the tables as well as copy them to the Windows clipboard. Click to see an example of the screen display (23K image). Click to see a sample pie graph (16K image).  Click to see the graphic display choices (17K image). Click to see a sample harmony/discord bar graph (7K image). The principal display and printout summarizes the Power and Harmony for the Planets, for the Signs, and for the Houses. This display has five data columns, showing in rows for each planet, the power, the harmony+discord, the harmony, the discord, and the neutral astrodynes. You can also select Display Aspects, which summarizes in a table the power and harmony of individual planetary aspects, including parallels of declination. Astrodynes for Windows will display on-screen the names and record numbers of all charts in the calculation program's saved chart files. You have the option of selecting more than one chart at a time. The Astrodynes for Windows program is especially useful to anyone who is doing astrological counseling. By totaling the power of each planet, sign, and house in the native's chart, astrodynes quickly reveal the native's true ruling planet and dominant factors. Also, astrodynes show the counselor the areas of life in which the native is able to operate most easily and effectively. As an example of astrodynes interpretation, we will use sample printouts for Wolfgang Amadeus Mozart. Astrodynes' power column shows that the moon and Neptune are Mozart's dominant planets, but the relative harmony/discord column shows that the areas of Jupiter, Venus, and the Midheaven came easily to him. Mozart had difficulty with the areas covered by the Ascendant, Uranus, and Saturn. Click to see the astrodynes planets printout (11K image). Astrodynes shows that Aquarius and Sagittarius were Mozart's dominant signs, but that the nature of Libra came easily to him. Click to see the astrodynes signs printout (11K image). Astrodynes shows that the fifth house was Mozart's dominant but most discordant house. Affairs of the second house came easily to him. Click to see the astrodynes houses printout (11K image). You can use the new batch processing ability to find power or harmony differences between different chart collections, such as a collection of musicians versus a collection of scientists. Click to see the new screen of batch processing results (73K image). What you see there is the ranking for power of all the planets in the file that you analyzed. The rankings go from 1 (most powerful) to 12 (least powerful) for each planetary row listed in the left hand column. The same is true for all other Astrodyne elements (Harmony, Discord, Neutral, Harmony+Discord). For the display shown, there were 450 charts that had the Sun dominant or most powerful, 276 charts where it was 2nd in power, 199 charts where it was 6th in power, etc. There were 103 charts where Jupiter was most powerful, 246 charts where Uranus was 8th in power, etc. When the Astrodyne element selected is Discord then the rankings are from most (1) to least(12) discordant. The Harmony+Discord selection produces the rankings for best(1) to worst(12) planets, signs or houses. Your computer has never had so much intelligence for processing large amounts of chart data. Last modified on January 6, 2014.